Sticky traps are quite valuable to growers. They are used for one of two things: Trapping or monitoring. 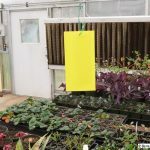 Putting traps out in numbers can be effective in reducing airborne adult populations of certain pests like whiteflies and fungus gnats by trapping them. 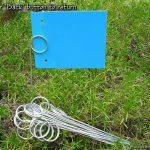 If used at the rate of one trap per 250 square feet, though — or one per 1000 square feet in larger or monoculture greenhouses — and checked, pests counted, on a regular schedule, changed as needed, and the results charted, sticky traps can be an effective monitoring tool. 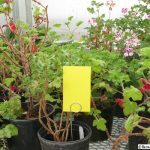 Use yellow sticky traps to trap/monitor most pests. (Includes whiteflies, fungus gnats, shore flies, thrips, winged aphids, leafminers, scales, and many others). But be aware they may inadvertently capture parasitic wasps, midges, and beetles. Use with care. Reduce hang-duration if needed, just be consistent. 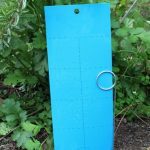 Use blue traps are for thrips only, which is helpful if you need to monitor for thrips while excluding the inadvertent capture of parasitoids like Aphidius spp. and other at-risk biocontrols. Hot pink is supposed to be another good color for thrips, but is not a commercially available trap color. To learn more about scouting and putting sticky traps to use, see the Scouting Info and Scouting Plan pages. Also check out these ID tips to help you identify what you might capture.